She makes some of the coolest dolls I've ever seen. My mouth fell open in amazement the first time I looked at her blog and saw her work. She and Hubby's creations are unbelievable, detailed, whimsical works of art! Plus, she is a hoot to read. 1)Name and link back to the person who tagged you. 2)List six things 6 (un) important things that make you happy. 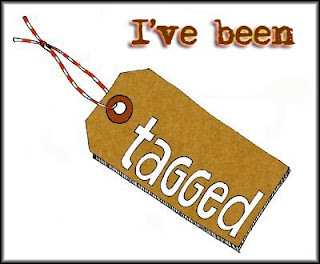 3)Tag 6 bloggers and let them know they're it by leaving them a comment on their blog. So here are happy little tidbits that make me happy. Wiener Dogs... yes, I love those lonnnnnng, short to the ground, wiggling from snout to tail dogs Gary Larson named a book about, "Wiener Dog Art" and drew multiple cartoons depicting because they look like cartoon kinda dogs. Talking to people standing behind me--or in front of me--in the check out line at the store. Stopping on road trips whenever, wherever and for whatever I want because I'm the grown-up now and can honor my child heart to pull over whether or not I have to go the bathroom. Now here are the 6 bloggers I am gonna chase, tag and proudly say, "You're it!!!" Jessica (and Chloe) at Chloe the Doxie Love Pop in to wish Chloe a Happy Birthday. She is cuter than you can imagine! Tina at Yes, That's My Child Screaming Lots of great ideas here. I fell in love with the name of Tina's blog and had to stalk her. Rain at RainCrow Galleries Rain has a healing touch to her work and you can feel it just looking at her paintings. James at Windows to the Words This blog is a place where creatives can meet, mingle and merge. Fabulous! Thanks for the Tag - I am going to decide who to pass this on to over the next few days - and thanks for those comments - can't remeber if you're on my global blog-roll - if not - you will be soon !